This is the back of Robin's car when loaded up to deliver or get ready for the next venue with all 43 quilts! This is my car loaded up with all the racks and PVC building stuff for the displays. Here are Holly and Robin after we loaded both cars in the cold and snow after a great selling day! PRICELESS!! If you can see the lone star in this photo, Robin made this one too. Both it and the cherry quilt have been very popular as well. Here is a great photo of the completed Big Ten quilt. I am hoping when you click on it you will be able to see LTW's great quilting job. This "M" string quilt has been very popular too. I don't think you can see it but the U of M fight some is quilted into it. It begins at the top, goes around the right down across the bottom and finishes up on the left side. I had to look up the words though as I only know the words to the MSU fight song! I know I had talked about Amy's quilt. I have become just a little obsessed with it. Here is my cat inspector keeping my strips warm and "pressed" while I am sewing. Thanks, Jack. In addition, you can see the border on the arm of the couch. I was trying not to repeat any of the colorful fabric in the quilt hence the ziploc bag. I had to keep it up on the back of the couch so I could build it and see the colors as I went along. I worked all weekend on this quilt but still had 2 rows of blocks to make and then sew into rows and then sew to the quilt top. I also had to do all the borders. I worked for another 5 hours last night and *finally* got the top finished!! (And in case you are wondering, like my DH did, the strips are NOT supposed to match up!) I showed the top to him last night and he says to me, "I hate to tell you but did you realize the strips don't match up?" *sigh*, Of COURSE I know that, they were not supposed to match!! I asked LTW if she thought there was such a thing as variegated blue, green and purple thread and she assured me that there was. She emailed me to tell me that she ordered some! Won't that be pretty? I am going to use black (hopefully flannel) on the back. Maybe just plain black. I counted up how many quilts I have finished this year and I have 22 done (counting this one). I somehow thought it was more, but hey it 's all good. DD2 has an interview for Study Abroad today so keep her in your prayers. She is studying for a degree in Fisheries and Wildlife with a minor in Marine Science (difficult in a state without an ocean, just LOTS of fresh water!) She is hoping to get into the program that will be in the Galapagos islands this summer. I'll keep you posted! Well, it is a wet and snowy day here so I am going to go and become part of the traveling quilt show soon so I wish everyone a Happy Thanksgiving (If you are in the US). If not then take a minute to count your blessings and what you are thankful anyway, it never hurts! We had two more shops to go and these were the only things I bought at Sew Together in Richmond. They were 50% off! I love the Pumpkins gone wild line! Good thing I didn't need a lot cut as the woman cutting was the slowest cutter I have ever seen. Really, I mean it. She was very nice but really really slow and God help you if you let her fold your fabric!! We were late because of the stop in Fort Gratiot (and the slowness of the checking out and cutting) so we got to Quilt-n Friends in Sterling Heights and were the only ones there. The shop workers and the owner could not have been any nicer! I got this jelly roll for 50% off too!! As we were getting ready to leave and everyone was in the bus she turned out the lights and we all laughed then she turned them back on again and waved to us with a huge grin on her face!! So after our big adventure we were finally on our way home! I forgot to tell you that I had a severe head cold that began on Friday and I was so drugged up because you know I was NOT going to miss this day of quilty goodness!! I am, BTW feeling much better now although I am somewhat concerned that my brains have been replaced by snot. We'll see!! I had placed an order with eQuilter that showed up of Friday before the shop hop which was quite good since I wanted to bring the focus fabric for Amy's quilt with me. I also had a discount coupon so I ordered the 2 fabrics shown here for the stash. Someday I will make a King Arthur quilt for ME!! So the focus fabric is in the center and all of the new fabrics I bought for Amy's quilt are around it. I am so excited to begin it! Let me tell you a little secret, I began Amy's quilt on Tuesday when I stayed home with this blasted cold. I designed it on my trusty graph paper and boy am I glad I have that to refer back to because it is a little complicated. I pulled some additional fabric from my stash to use and so I should have enough without buying any additional fabric. I realize that I don't have a lot of purple but I am hoping I can use what I have without buying more. When I get a little farther along I will show you what I have. The quilt calls for 80 blocks and I have almost half of them finished!! It is really turning out to be a spectacular quilt. I have to make soup for another fundraiser and then some pumpkin pies for my friend from Brazil that loves pumpkin but will not be here for Thanksgiving, so probably not much sewing tonight! Maybe I'll take a picture of the food! LOL. I was a Shop Hop Virgin! I have been so busy at work with the quilt raffle that I have not posted (I think it did not help that I have been really sick either! So now I will be catching you all up on what I did on Saturday. I went with my friend, Charlotte, on a 7 stop Shop Hop!! I was a Shop Hop Virgin, but no more!! See me there on the left in the green?? Char is next to me. We picked up the bus at our LQS Bits and Pieces. They had bagels and juice ready for us as we boarded the bus too. We had to be at the shop at 7:30am!! All Aboard!!! C'mon and I'll tell you (and show you) what all I bought! Oh...and this adorable Halloween print. On to Lake Street Mercantile. I love this shop! Look Anna, more red and whites for the star quilt you designed for me!! And more aqua for Amy's quilt (DD's friend). How cool is the "rain" fabric? That one was for pure stash enhancement! Next Stop...Aunt Nan's Fabrics in Oxford. I bought these for a friend as a gift. They are so pretty. I hope she likes them as much as I did!! Who do you think they are for? Can she guess? The fifth stop on our trip was to Sew Elegant in fort Gratiot. A LONG way from home! The weather was slushy and nasty. It couldn't decide between snow and rain! We got our lunch on the bus on the way to this shop. Jimmy John's YUM!! The store was a little small for how much quilty "stuff" was stuffed inside. I loved that they had so much fabric, but we were supposed to be here only for 30 minutes and that was NOT enough time to look around! Plus the ladies cutting (bless their hearts) were very, very slow at cutting! No, joke, I waited almost 30 minutes to check out and there were only 4 people in front of me!! 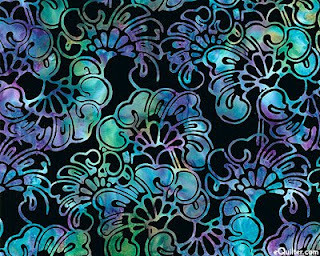 One of the things on the list included companion fabrics for a panel I bought for another gift (I'm not sayin' for who = ) Noticing an aqua theme in this post? 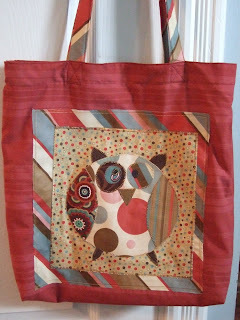 I was all finished and had paid and everything when I saw the Creepy Owl fabric and I had to have some. I had never seen this before. There were hundreds of bolts on sale and this was one of them so I got a yard for $3.50! Plus those other 2 cute Halloween fabrics. For those of you who know me this should not surprise you at all that I bought this adorable cat panel. (I am owned by 5 cats!) I had just seen a pattern in a magazine (Now I have to try to remember which one!) using this pattern and I thought I would never be able to find the panel, go figure, right? Now I have the panel and no pattern!! I will find it eventually (I hope) any clues would be greatly appreciated. I have 2 more shops to tell you about but I have run out of time. I will post more of the trip soon! Until then, let me know if you have done a Shop Hop before! What time of year you ask? Why time for the U of M department of Pathology quilt raffle!! I am showing you some photos in the Cardiovascular center of how we had them up and displayed on Thursday and Friday. If you go to the department's website you will be able to view each quilt in full view and up close. Those photos are so much better than mine! The beautiful lone star was made by my friend, Robin and you should see the quilting LTW did on it! My friend's Yuki and Judith made this sampler and LTW quilted each block differently! This lighthouse quilt has light houses from Michigan cross stitched on each block. The one on the far left was done by a woman who's boyfriend had a liver transplant and was so grateful! It is a beautiful quilt. See the green and white one? That is the Spartan quilt! These 2 are just awesome! The Christmas one has lots of embellishments including a cameo on her blouse and earrings on her ears! The kids one on the right was BOM from a quilt shop in Saline. It is simply a stunning quilt!! Here is the Big Ten quilt that was a joint effort between me and 4 other women. I appliqued all the centers and cut the blocks into "kits". Then we all got together one afternoon and made the top and we gave it to LTW (who also made some of the blocks), so it was a very productive afternoon! The big M string quilt you have all seen on my blog in the past. The U of M fight song was quilted into the quilt!! the little Jack-O-Lantern is a Buggy Barn design and just as cute as can be! If you are interested in purchasing tickets they are $1 each or $5 for 6 tickets. You can go to the Pathology web page and fill out and print out tickets. You can send them to me in the mail. The money goes to patient families at the U of M that are identified as being in need by the social work department. If you are interested, please send me an email for my mailing address and I can tell you who to make checks to. Each quilt has a number assigned to it and you choose which number you want your ticket to be for, one number per ticket. So it is like 43 little raffles!! I had a really good night last night. I got home and went to quilting at the church with the ladies. A few months ago a really nice man named Jack came to us out of the blue and donated a lot (I really mean A LOT!!!) of fabric and notions to our church group. In return he had this Sunbonnet Sue quilt top that his mother had done and he wanted our help getting it finished. So since the top was already finished I got a back sewn and took it to LTW to work her magic. I can't believe this is how it turned out! She stitched around every "SUE" inside the applique with clear (smoke) thread using the same maroon thread on the back as she used for the "Sam's" and the quilting around each block. The quilt turned out just beautifully! Two of the CHV Quilters (Lucy and Pauline) volunteered to sew on the binding and hand stitch it down for him also. Well, Jack and his wife came to the church to pick it up last night and they were just thrilled with it! Makes my heart glad, I tell ya! As I stepped outside at the church to speak with DD1 I happened to look up an saw these beautiful, ice covered, berries! Aren't they beautiful? I went back inside to get my camera and the CL's were asking me why I needed my camera in the dark? I told them to take a picture of the beautiful berries, of course. Well, that meant they had to follow me outside and see them for themselves. The photo doesn't really do justice to how beautiful they really are though. I worked on binding the Secret Santa gift I have done now, but alas, I can't show you the gift until after Christmas. I have quite a few things now to send overseas, I am getting excited to wrap and send my package. I have several overseas packages to get together for friends in Europe too. In fact I am off to buy some things for them today, if I get a chance. I am going on a Shop Hop to 7 different shops this Saturday with my DF Charlotte. I have been making a list of things I would like to get for gifts and for the next year's Big Ten quilt so we will see how I do. We are taking a bus with a lot of other women and we need to be at the bus at 7:30am and we return around 8pm. It will be a long and glorious day of shopping!! Hopefully I will be able to share what I buy. I won't be able to show what I buy for gifts until after Christmas but maybe some other things. I have been trying to come up with an idea for a quilt for DD2's friend. She had asked me to make her a quilt using aqua, green and purple and black. Sure, right, that's gonna be an easy one, right? NOT! So I was going through some magazines a week or so ago and found this amazing pattern in a Fons and Porter magazine that I had saved. It was perfect! I will use this fabric for the outside border (ordered from equilter) It has all the colors in it. This is the pattern I found. I will not use the batik throughout the whole quilt like they did in this quilt though because the fabric I choose is not black enough for that. I will use plain black. I will need bright blues, greens and purples for the strings to go with the blacks. I love some string piecing and thought this would be an easy one to get finished by christmas. Although I really need the focus fabric to be able to pull the colored fabrics and I am trying to wait patiently (really hard for me to do!) According to the tracking on the package, it should be at my home on Friday, which is really good because I want to be able to take it with me if I need to to fill in any gaps from what I already have that may go with it. I am interested if anyone else has made this quilt? It is done with string piecing on a foundation (which is super easy, think St. Pat's and the "M" string quilts) so I think it will go quickly. If not, I will save it for a graduation present in a year, lol! Just in case you were wondering, I have not fallen off the face of the Earth! I have just been super busy. Lacrosse registration is this week on Wed and I have loads to do before then. I have finally gotten some quilty stuff finished so thought I would take a minute and share what I have done. I managed to finish all the needle cases I had cut out for the craft show, yeah! Then I made labels for several quilts and bindings, so that's another tick off the list. 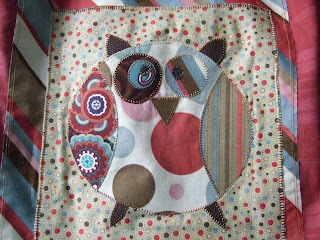 Then I had started this cute owl on Wed at CHV Quilting. I got him all stitched down and then made the bag he was supposed to go on. I just love him! I was thinking of giving him away but have decided that I just can't part with him. So there you have it, that's what I have been doing. Now I am asking for your assistance. My daughter, Kelsey (DD2) has a very good friend that is trying to get chosen to be on America's Next Top Model. There is a website with all 20 of the girls chosen from the Detroit area. You need to go to the site and vote for Dani20. I would appreciate you telling as many people as you can to go to the site and vote for her too. She grew up 2 doors down from us and was Kelsey's BFF until she moved. (Not far, still in the same community). They have recently reconnected and are becoming friends all over again. She is a sweet kid and wouldn't it be great to help out someone we know? I knew I could count on you for help! You can vote once per day, so stop wastin' time and go vote already! !